We are introduced to 4 new Flatbacks, 3 of which are available in both Hot Fix and No Hot Fix. All available in variety of colors and sizes, we think these are very versatile and are sure to look great on your designs. Click here to view our full assortment of Rhinestones and here to view our Hot Fix collection. 2205 Flame Flatback Rhinestone - Symbolizes fire, echoing a real candle flame. The Fire Opal (shown below) is a fantastic addition to any bold design! The pear shaped design exudes passion and adds a touch a glamour to a blank canvas. 2034 Concise Flatback Rhinestone – A much a sleeker and simpler addition to the rhinestone family. This style has a classic Rivoili cut but with a flatter and larger table size (increased 40%) along with a reduced weight – perfect for designs that need to be lightweight. 2078/H Framed Flatback Rhinestone - A gorgeous 2 for 1 style incorporating the sparkle of Swarovski crystal with the intensity of a metal frame around the stone. Offered in silver, gunmetal, and gold metal rings. This rhinestone is ONLY offered in a hot fix version. 2798 Contour Flatback Rhinestone - Reflects the raw, natural, and unspoiled beauty of the planet, offering a very organic shape. Its asymmetrical facets and table top show us that this style is unlike most classics but allows us to create unique and strong design patterns. There are 2 new beads offerings within Spring/Summer Innovations 2017. In alignment with the Nature theme, both beads are unique in shape, showcasing natures’ unusual but exceptional creatures. See all of the Swarovski Beads that HarMan has to offer. 5728 Scarab Bead - With its attention-grabbing and life-like shape, this interesting crystal cut bead is inspired by the scarab beetle and Ancient Egyptian culture. Fun Fact: The Egyptians have forever characterized the scarab beetle as a symbol of luck! It is especially an unconventional element when featured in last season’s Crystal Scarabaeus Green (as shown here). 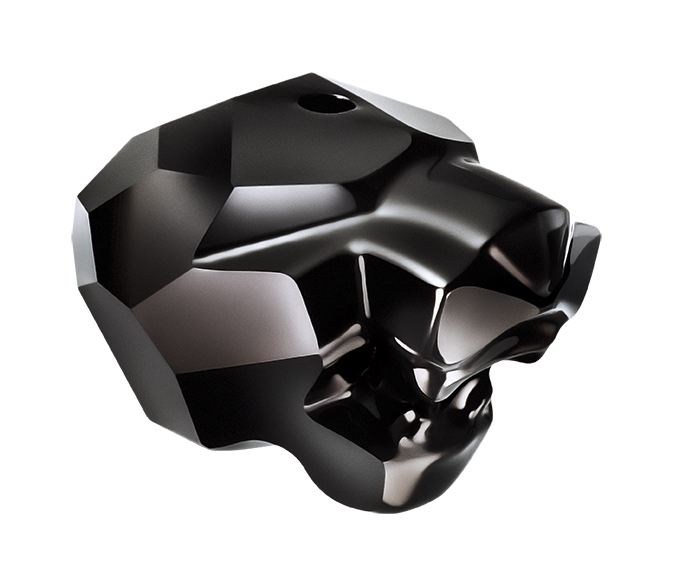 5751 Panther Bead - Taking crystal cutting to new heights, the artistically designed and cut Panther Bead depicts the head of this feline predator, which is dramatically life-like! String this powerful bead on your jewelry designs for a high-impact look. 6533 Raindrop Pendant – This simple drop pendant is offered in various crystal colors with two different choices of metal cap finishes: gold and rhodium. It has a multi-layered cut that creates a playful sparkle, adding dimension to its simple, natural appearance. 67511 Pave Tiger Pendant – This pendant, available in gold, rhodium, or gunmetal plating, embodies the spectacular spirit of the majestic tiger with beautiful pave set stones throughout. The tiger represents power, strength, and a fighting spirit. It would be a gorgeous centerpiece for a necklace design or spirit wear! Go Wildcats! 67523 Pave Dragonfly Pendant – The Dragonfly Pave Pendant is available in single-colored or multi-colored versions with a filigree pave finish. Its gorgeous shape which symbolizes harmony, change, and self-discovery will dazzle when used in jewelry design. 4485 Twister Fancy Stone & Setting – Inspired by a windmill, the Twister Fancy Stone resembles a twirling, four-pointed star. A play on a classic shape, this stone lends itself be to a light, airy, and modern design component. This stone comes in 6mm, 10.5mm, and 17mm all which have a matching Fancy Stone Setting available. As part of Swarovski’s "Balance of Nature" theme, Swarovski has launched 4 innovative BeCharmed Collection Beads that are representative of the elements: Earth, Air, Water, and Fire. Each of the beads are 14.5mm and can be added to any BeCharmed bracelet design! 82013 Pave Earth Bead – Showcasing an "earthy" color palette encrusted in pave stones featured in Topaz, Light Colorado Topaz, and Smoky Quartz. 82023 Pave Air Bead – A delicate filigree multi-colored bead consisting of Crystal Silver Night, Light Sapphire, and Crystal Silver Shade. 82033 Pave Water Bead – Featuring a calming combination of Blue Zircon, Aqua, and Crystal AB crystals. 82043 Pave Fire Bead - A unique and bold gradient combination of Topaz, Light Siam, and Jonquil in a pave finish. Swarovski encourages us to take a walk on the wildside with the introduction of the new animal print beads. 81974 Pave BeCharmed Leopard Bead and 81982 BeCharmed Pave Zebra Bead are modern accent beads that highlight the beauty of natural patterning. This season also introduces us to the first ever Metalbeads in the BeCharmed Collection. The unique design of 81951 BeCharmed Heart Bead and 81961 BeCharmed Edelweiss Bead are the perfect additions to the BeCharmed product assortment. The metalbeads have two sides surrounding the 5mm hole, the center of each metal side houses a flatback rhinestone for an extraordinary sparkle! Lastly, there are two new charms that are added to the collectible BeCharmed family. Similar in design to its corresponding pave pendants, the 86541 BeCharmed Pave Tiger Charm and the 86553 Pave Dragonfly Charm have a pinch bail at the top center of the stone for easy application. The charms are an eye-catching piece for personalized bracelets or are an easy choice for hand-sewing projects. As you can see, the Swarovski Spring/Summer 2017 Innovations, are calming and inspiring, showcasing the importance of natural elements in our world amidst all of the day-to-day chaos. If you have any questions regarding the Swarovski Spring/Summer 2017 Innovations or would like to place an order, email us at sales@harmanbeads.com.